O, our sweet cat. Torgi is definitely diabetic and has to have twice-daily insulin injections from now on. 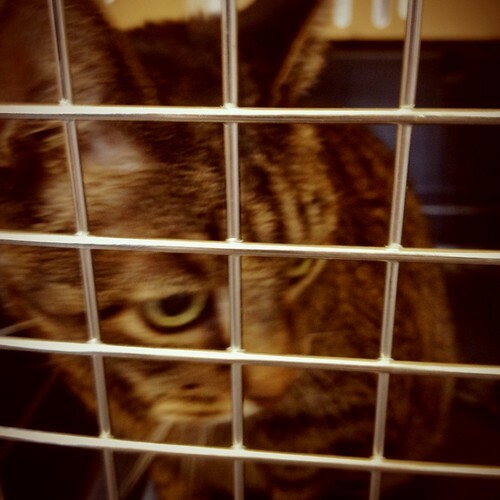 The three of us went to the vet’s to learn all about the injections, treating hypoglycaemia (a word that looks so much scarier with the British spelling), and our new world order. FunkyPlaid and I had already administered subcutaneous injections before, but we had to practise on our baby with saline as the vet supervised. Afterwards, we discussed the logistics and timing of it all while Torgi wandered around the examination room and opened cabinets with his little monkey paws. Our immediate future will be a bit challenging as we figure out what Torgi’s optimal insulin dosage is, which requires a bit of trial and error as well as close observation. Our focus is on stabilising Torgi while keeping an eye on the mass, since we’ll be going back to the vet’s every few weeks for blood glucose tests. Both Zen and Torgi have had smoked salmon — not the treats, mind you, but actual smoked salmon — twice in two days now. Zen thinks it’s Christmas. Halsted M. Bernard is a writer living in Portland, Oregon. Her short stories have appeared in Innsmouth Magazine, Map Literary, and Bewildering Stories, and she has performed at the Edinburgh International Book Festival, both as a Story Shop participant and with the literary writing and spoken-word performance group Writers' Bloc. For more about Halsted's publications and performances, please see her "Fiction" page. Halsted is also a librarian, online diarist, VR enthusiast, runner, gamer, knitter, lover of fountain pens, excruciatingly amateur photog, a former Yankee expat in Scotland, and other things sans links. Enter your email address to follow cygnoir.net and receive notifications of new posts by email. This is a personal website. The opinions and views expressed therein are solely the author’s and not of any organization or employer. They are also subject to change, because the author is human, fallible, and always learning. Caveat lector.